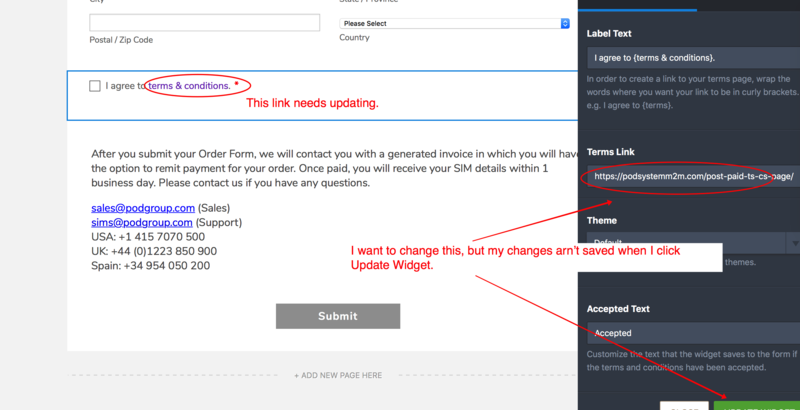 When I try to update the link under "I agree to terms & conditions" via the widget settings, I can change the URL but the the changes aren't saved. Nothing happens when I click the "Update Widget" button. I'm using a Mac with Safari 11.02 - but the problem persists in Chrome too. I have cloned your form and I was able to replicate the issue. Can you please try adding another instance of the Terms and Conditions widget and removing the widget that is not working. A follow up question- should I delete or hide the inoperative widget? There is a note saying that the data may be lost if this is deleted, we need to keep account of who has agreed to our T&C's but I also don't want to clutter up the form with unused fields. What do you suggest? Yes, that is correct. Deleting the field would also delete the data for that field. I apologize for not mentioning that. Since that field is required, it means that all the users who submitted the form have agreed to the terms and conditions. I suggest you hide it if you want to keep the data for the previous submissions for that field.